Zion Zipline at Zion Canyon | Zip Line and Heli-Zip Tours at Zion! We have zipline tours starting from $85. Take your Zion adventure to a whole new level with a zipline experience! 4 Proposed Ziplines to start totaling 3,500’ at the entrance of Zion National Park and Zion Canyon. Enjoy the amazing lava clifftop views of Zion’s famous West Temple, Smithsonian Butte, and the Virgin River valley below. Our very own exclusive ultra safe and reliable progressive air cushion trolley brake stopping system. Zion Helicopters will be providing the Heli-Zip Tours to the lava clifftops from its brand new Zion Utah Facility. Advanced Pneumatic Air Cushion Trolly Braking System that will allow for speeds up to 70mph and back to 0. Zip Line enthusiasts from around the world will soon be able to experience a world class Utah Zip Line experience like no other, while at the same time also enjoying the amazing lava clifftop views of Zion’s famous West Temple, Smithsonian Butte, and the gorgeous high panoramic views of the lush and green Virgin River valley below. Zion Helicopters will be providing the Heli-Zip Tours to the lava clifftops from its brand new Zion Utah Facility that is also currently under construction and located right at the base of the Zipline complex and right on Highway SR-9 and the Virgin River. 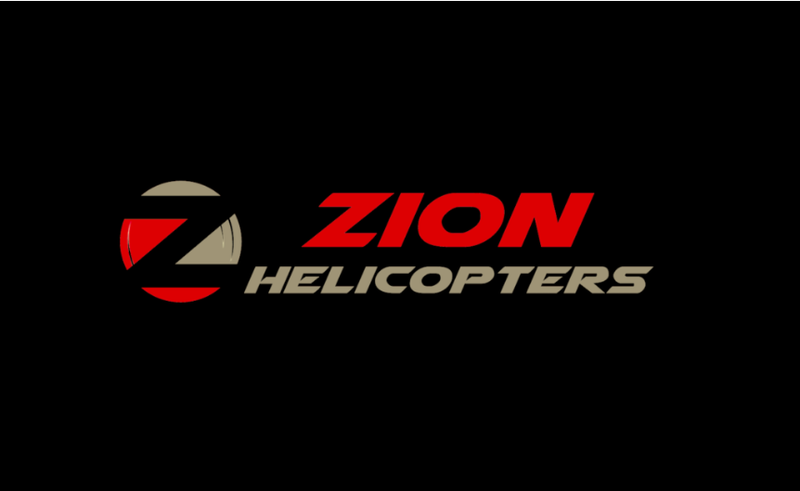 Zion Helicopters primary operation in Hurricane Utah is open now for Zion National Park tours. Zion Zipline is currently finalizing engineering, testing, and initial construction of the first eight steel and stainless steel zip-line platforms to be erected on the steep lava cliffs and bluffs at the entrance of Zion National Park and Zion Canyon, and we have plans to be open by Summer of 2019. Experience Zion in a new way with zipline tours, helicopter tours, and 360 jeep tours. Click below to learn more. Guaranteed to be an experience you will never forget, Zion Helicopters offers helicopter tours around Zion that unite the astonishing beauty Zion with the pure thrill of light! Experience the best of both worlds with a Zion 360 adventure by combining a spectacular helicopter flight with a rugged off-road adventure! See below what other zip liners have said about their experience with Zion Zipline. "We loved our experience with Zion Helicopters and we can't wait to come back when the zip line is ready!" "My family and I have gone to Zion for years and we are so excited for a zip line! Such a great idea!" "We heard about the zip line from Zion Helicopters and drove by the site on the way to the park. Can't wait for it to be here!" Click on the link to the right to read more about your Zion Zipline adventure at Zion Canyon! Here you can find all of the details regarding the Zion Canyon Zip Line and much, much more! 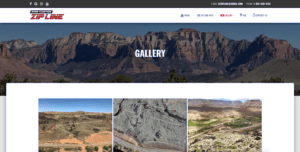 Click on the above image to be taken to our gallery of images for Zion Zipline and Zion Helicopter Tours! 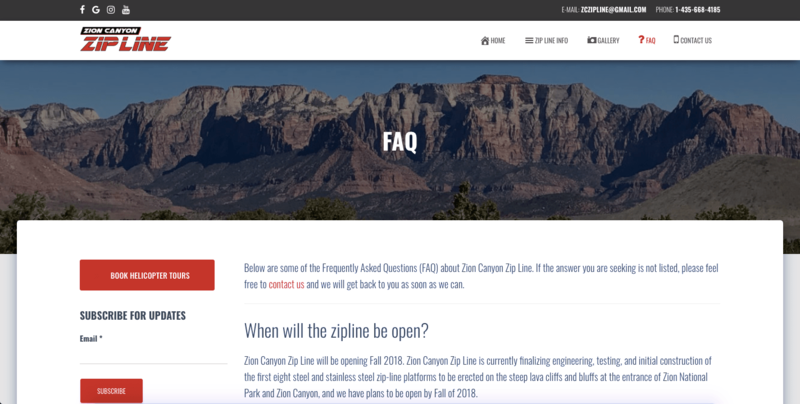 Here you will find the answers to some of the most frequently asked questions about Zion Zipline. Have any questions? Send us a note and we'll contact you as soon as we can!